A California coast tide pool. Can you find the Sculpin fish? 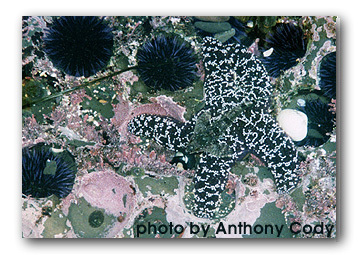 My first ocean encounter happened while on an overnight field-trip to San Francisco in 7thgrade. Our Science Club traveled from Reno, Nevada by school bus to visit a museum, the Fisherman’s Wharf, and the tide pools on the coast. I had no idea how this experience would eventually impact my life. Our teachers, who were our guides, lead the group to a steep drop off where the land ends and the beach lies below. Carefully we picked our way single file down a worn path cutting through a sea of ice plants descending slowly to the sandy shore. Outcroppings of rocks trapped the cold ocean water, forming small natural containers for water AND living sea organisms. We had to step carefully to be sure of our footing and to avoid crushing the live inhabitants of these rocks. California mussels closed tight to preserve their moisture, and slippery seaweed covered most of the rock surface. They were waiting for the sea level to rise again. Peering into the sparkling pools revealed spiny purple sea urchins, colorful sea stars and tiny crabs, betrayed by their movement across the pool bottom. Seeing these organisms up close was amazing to me and created a lifelong memory. It awakened a curiosity about living things that inspired me to study biology in college and become a science teacher. I am Susan Kaiser and I teach 7th grade Life Science at Pine Middle School in Reno, Nevada. Soon, I will be embarking on a voyage that combines all of these elements: biology, sea organisms and teaching. It promises to be even more memorable than my first trip to a tide pool. Best of all, I get to bring my students at Pine along with me! Well, at least through this blog…read along and see what is in store. 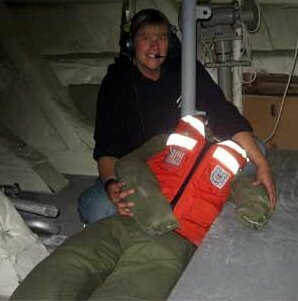 Since, 1990 NOAA (National Oceanic and Atmospheric Administration) has been including teachers on board their research vessels through a unique program called Teacher at Sea. Each year teachers apply from across the county and about 25 are selected to participate. After several years of wanting to apply, I finally mustered my courage and completed an application. I am proud to have been selected and will sail aboard the NOAA Ship Nancy Foster leaving from the port of Key West, Florida. 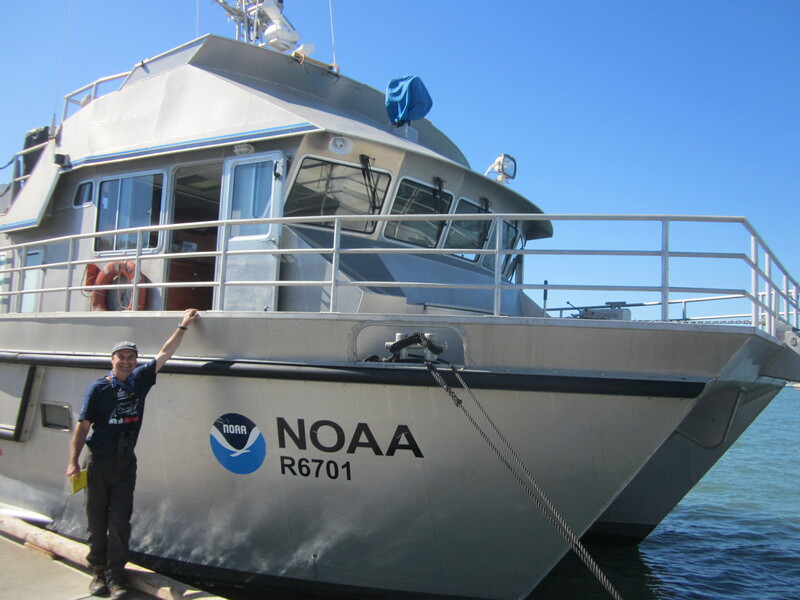 I will have the opportunity to observe and learn about organisms in the Florida Keys National Marine Sanctuary with the help of the crew and scientists led by chief scientist, Scott Donahue. 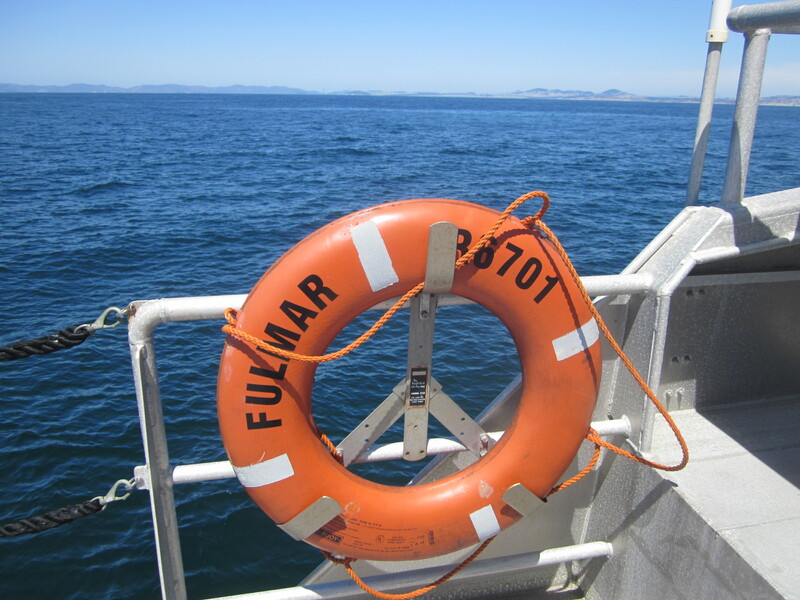 Their research includes monitoring sensitive marine organisms over a long period of time. 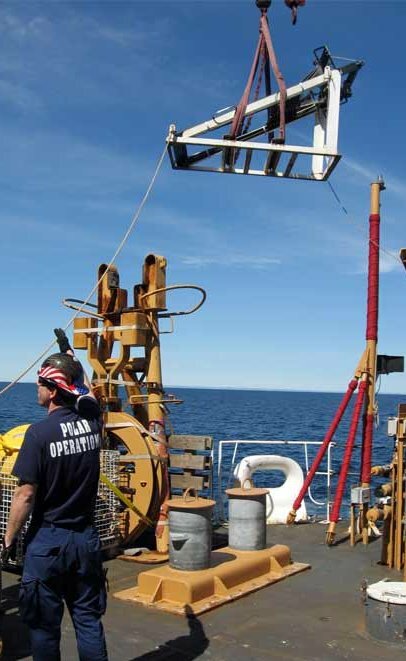 In this way, scientists can detect population changes that may occur due to extreme events such as hurricanes, harmful algal blooms (HAB) or more recently, impacts of possible oil spill contamination. You can see that I have some homework to do to prepare for this adventure. I am reading the websites you can click on and learning all I can to contribute to the success of the mission. 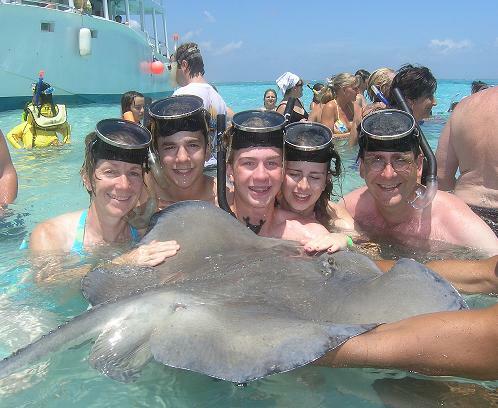 Here we are snorkeling and meeting a ray in 2005! That is me on the left. Then my sons, Nathan and Stefan, my daughter, Rachel, and my husband , Phillip. If it could get any more exciting, I saved the biggest news for last. In addition to working alongside the scientists and living on an ocean-going vessel for two weeks, I may also have the opportunity to snorkel in the coral reef study areas. To be truthful, my snorkeling skills are a little rusty. Living in the desert makes it a challenge to stay in practice! The last time I snorkeled was on a family vacation in 2005. But not to worry, I have a plan. I have been spending time at the pool practicing with the snorkel equipment I borrowed from my friend and colleague at Pine Middle School, Jencie Fagan. It turns out that Ms. Fagan is SCUBA certified and willing to help me build my skills before I set sail next month. Thank you Ms. Fagan, you rock! 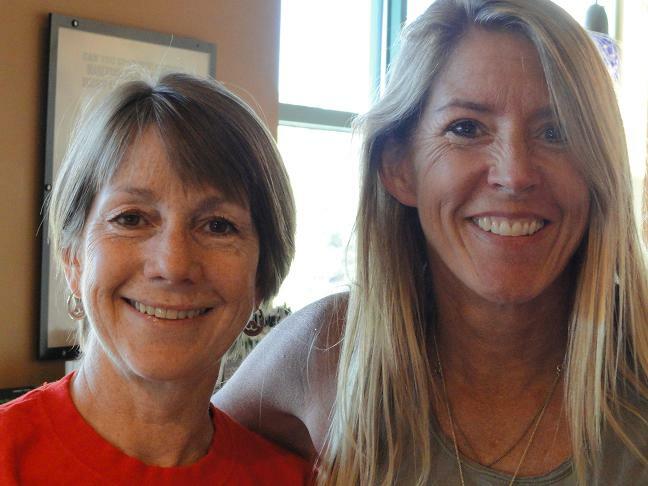 Me and my snorkeling tutor, Jencie Fagan. It is time for my practice session at the pool. 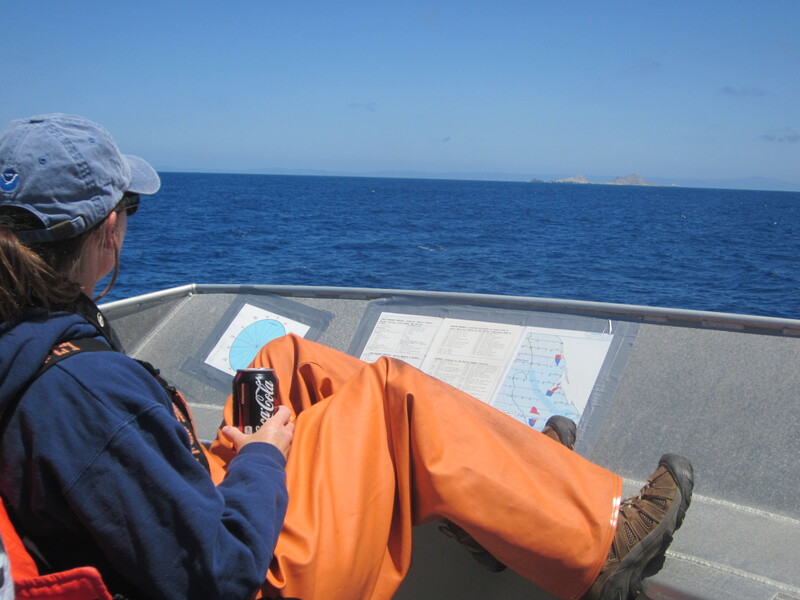 The next time you read my blog I will be writing from the NOAA Ship Nancy Foster. Join me on this adventure of ocean learning. What memory will you make of your 7th grade year in Science? Today will be the last installment of my meet the crew Monday. There are so many people that I would love to interview and share in this forum, but there is just not enough time in the day. To start today we have MK1 Allan Whiting, and an amazing list of responsibilities he and his department have on board. MK stands for machinery technician, and is within the engineering division. 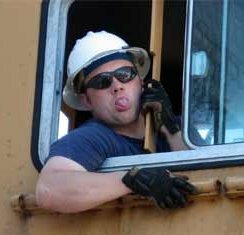 Allan’s “A gang” is responsible for EVERYTHING that doesn’t move the ship, thus auxiliary equipment, refrigeration, cranes, hydraulics, water (can make up to 8000 gallons of drinking water a day), winches, therefor a lot of responsibility. 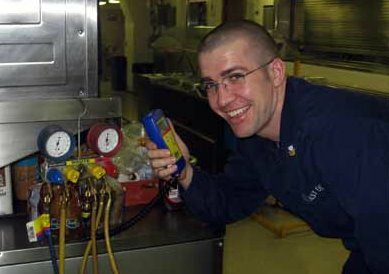 Working on refrigeration is only one part of his job! 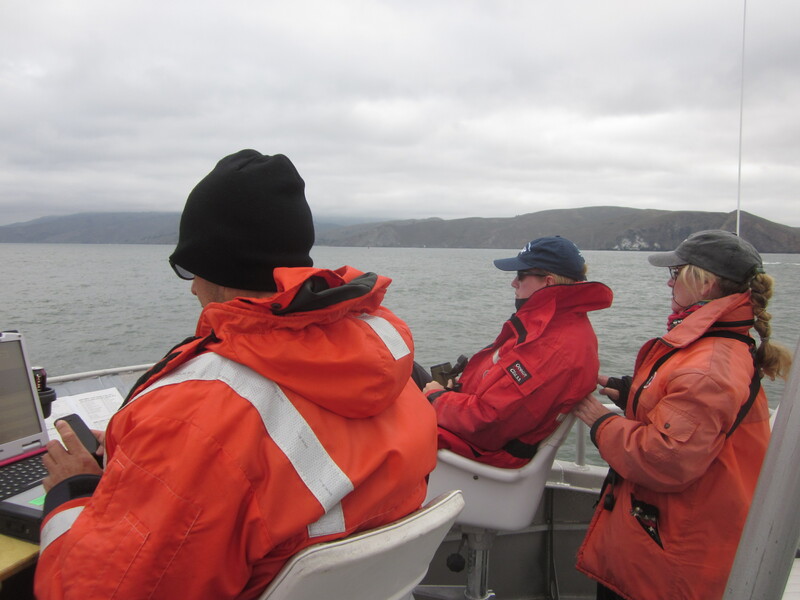 I think I have previously talked about the scientists as being a web of different fields that drive a bigger picture of how this entire Bering Sea Shelf Ecosystem is changing and adapting with global climate differences. Well the vessel is not too dissimilar. Each person, each division is a vital link to the effective and smooth running of the ship, and if the vessel didn’t work, neither would the scientists. Another responsibility for the “A gang” is the transfer of the starting 1.3 million gallons of fuel from storage tanks while we are underway. 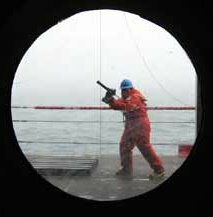 These “A Gang” members are the “FOWK’s” of the vessel; Fuel, Oil, Water, Kings,” and out technical gurus should any fuel casualty occur. So as you can tell a lot of responsibility with this department. Where Allan is a lead with the “A Gang,” EM1 Hans Shaffer works with all things wires. 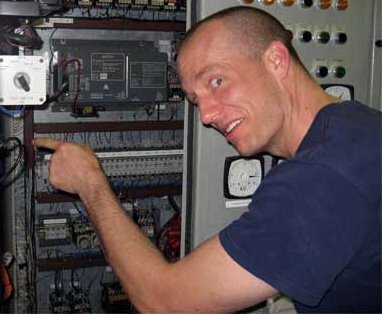 Yes, he is one of our electrical specialists and if it generates, or uses power Hans is part of the team that is responsible for making sure it works. From all monitoring systems, to the propulsion and even lighting systems, without the electricians the ship wouldn’t move. While working on the cyclo-converter I stood way back! Hans also works with the cyclo-converters, and I must be honest, I know that they take 1444 volts at 60 hrtz and convert it to usable power, but that is about all. This technology is one that I have never studied. It is a shocking shame I am not more wired in on the intricacies of electricity. All I know is this electricity is directly proportional to the speed of the propellers and for a vessel, propeller speed is very important. I usually do only two people on my meet the Crew Mondays, but today I would like to add two more individuals into the mix. 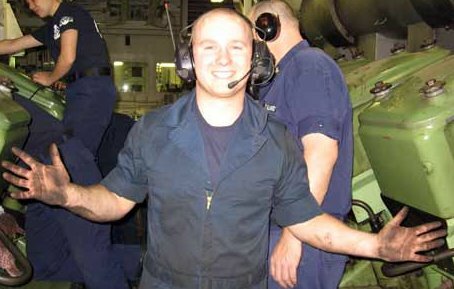 There is camaraderie on this vessel that is amazing, it really is a family. And a family that exponentially doubles every thirty days or so with the advent of the scientists, yet still all are welcome. Smiles abound and I have not once felt unwelcome. 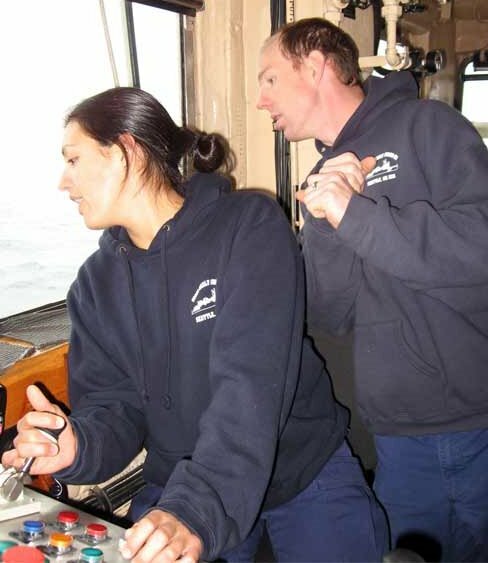 FN Angela Ford learning how to operate the winches with excellent guidance from MST1 Chuck Bartlett. FN Angela Ford is one of those people who always has a smile, and who appears to always be learning new skills. Angela started out in the deck department, and then transferred to engineering (which I have heard is a bit difficult to do). Angela is also studying to get rated as an YN3, Yeoman third class. 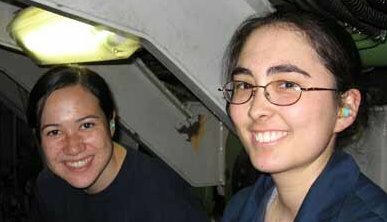 If you see Angela she is either studying, doing rounds with engineering or learning new components of the vessel. Yesterday while in Aft-Con Angela was supported by the MST crew and took a hand at running the winch to deploy and retrieve the CTD, it was great to watch. Under the guidance of MST1 Chuck Bartlett, Angela jumped right in, ready to learn something new. As an educator I was not only impressed with her desire to learn, but Chuck’s patience in teaching. The whole experience was an educational gift! XO Commander Bateman teaching me how to make a delicious pie. Unfortunately I could not stay too long, because I had my own educational experience waiting for me. 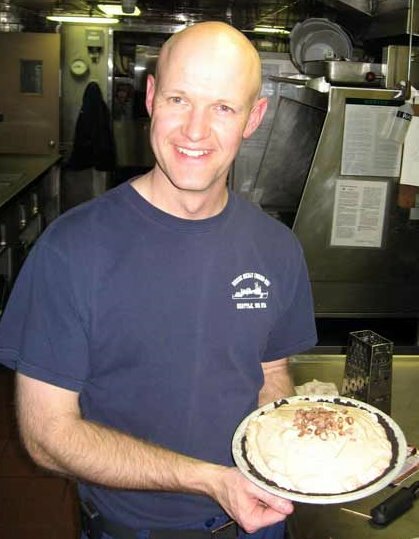 The XO, Commander Dale Bateman was preparing to give me a lesson in making a Chocolate French Silk Pie. Ok, get that smile off your face, because, well, let me tell you, it was one of the tastiest lessons I have had in a while. To make this recipe, you first construct a pie crust, then in a mixer blend the butter and sugar. According to the XO, you can never blend too much. Add the chocolate and blend, add the eggs and blend some more. To be precise once all the ingredients are in the bowl blend for at least 15 more minutes, you want this no bake wonder to be frothy and smooth. Place in a refrigerator over night, and in two hours I will be able to get a piece of our masterpiece, and let you know how the finished product tastes. Meet 1C Jennifer Peterson a senior at the Coast Guard Academy and MK3 Betty Brown, always smiling these two are. I would like to add a special thanks to all those who participated in the webinar today. It was wonderful to hear your voices, and even better to share with you this amazing adventure of discovery I have been fortunate enough to experience, thank you! FOR MY STUDENTS: Are you prepared for school in two weeks? Today is Sunday, and there is change in the air. For one, we have left the sun and re-entered fog. We have also started the 70 meter line back to Dutch Harbor. A large portion of the scientists have completed their work, and each station is now predominantly the CTD, calvet, and optics. With three days left, the tenor of the vessel is mellow, the frenzy of departure just a warm memory. Three full days and then on the morning of the 31st we arrive in Dutch Harbor. I am not ready to leave; there is still much to learn, and this goodbye will be bittersweet. Needless to say I need to get busy; there are words to be written. 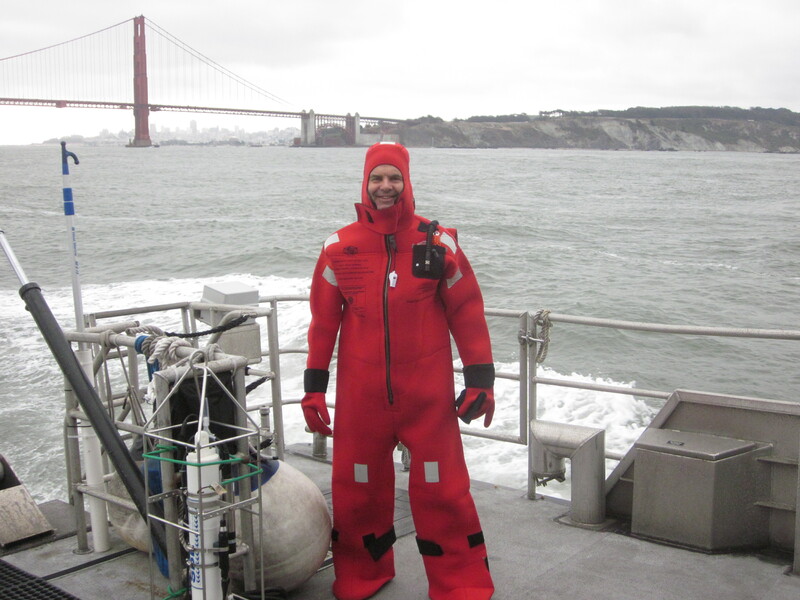 I recently received a blog asking questions about the vessel and yes, I have been lax about sharing information about the HEALY and what it is like to live on a four hundred and twenty foot cruising scientific ice breaking mobile command center that floats! 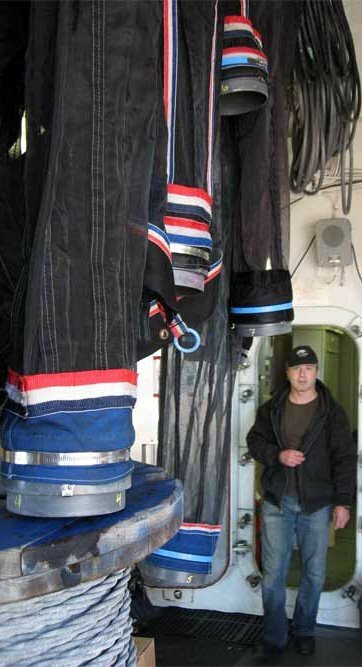 Here are the facts: –Four decks are dedicated to berthing –The Main deck is predominantly the Galley forward, the Engine space a mid ship and the science labs aft. –There are three more decks below the main deck and the bridge above the 04 deck. It is approximately 70 feet from the bridge to the water line. 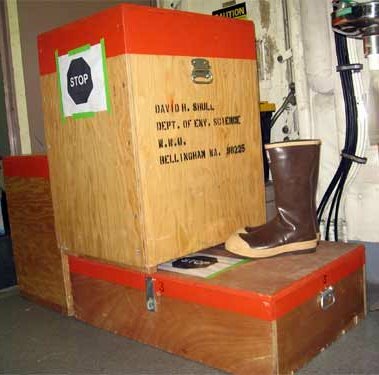 –There is a helicopter hanger and flight deck. 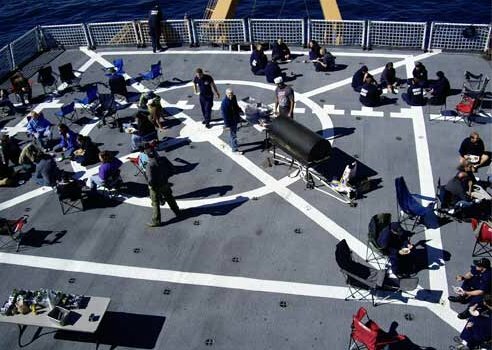 The flight deck without a helicopter is perfect for social functions. 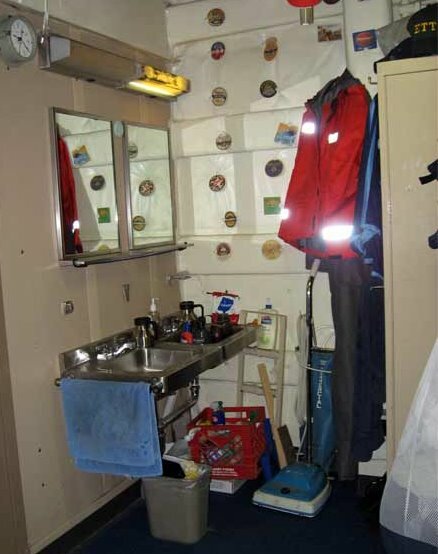 With the permission of the room mates here is a corner of a crew room, quite large. 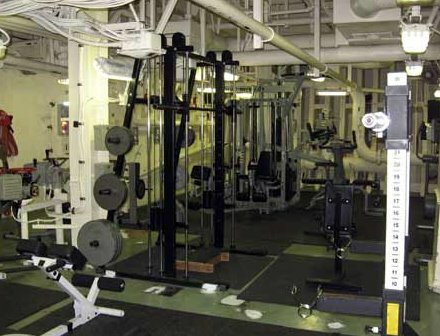 There is a weight room far forward and a cardio room off the flight deck aft. With a tv and all this equipment, anyone would be happy here! And the best of all, there are mapped out distances on the weather deck for those who wish to jog (stairs are part of the experience) –Don’t forget the ships store, they even have latte! There it is the bare bones of the HEALY, plenty of places to go, lots of things to do. 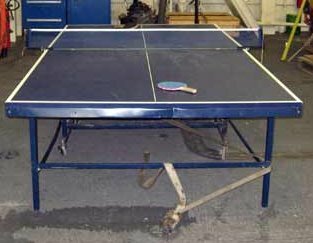 Bingo on the mess deck every Saturday, ping pong in the hanger. Not a moment passes when I am not trying something new. 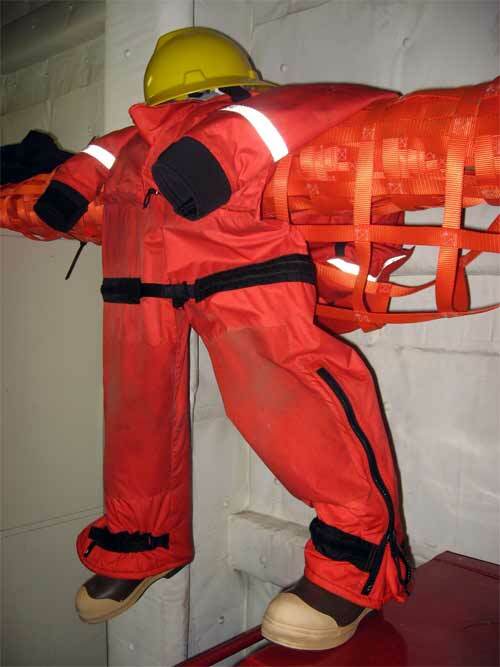 Everything on a sea going vessel is always strapped down. Even as the science of our cruise slows down my days are full. There is much still to learn and experience. This afternoon I was able to assist the XO in making a chocolate silk pie…tomorrow we eat! 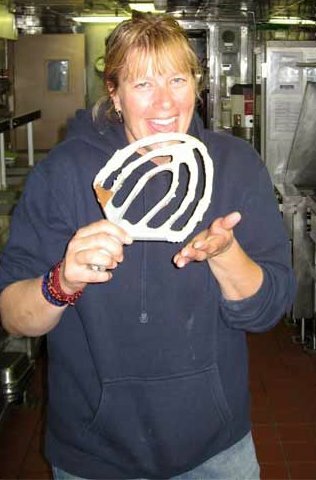 I am in heaven licking the beaters, and chocolate, perfect! Nautical Expression: “Square Meal” originally when ships were close enough of shore to get fresh vegetables and fruits, healthy fare. The meals were served hot on square plates., thus a healthy most nutritious meal was a square meal. 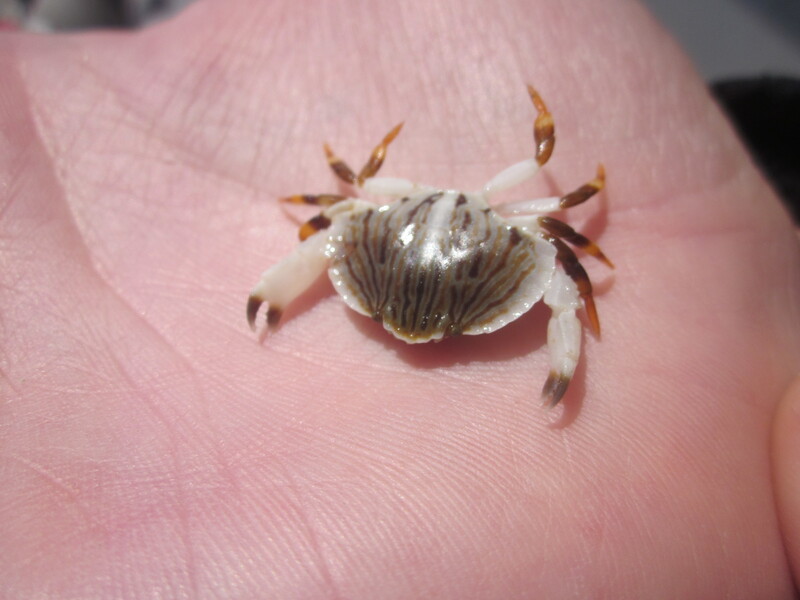 FOR MY STUDENTS: Think up an entire square meal based only on items you can eat from the sea? 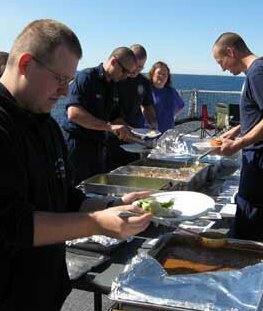 Saturday’s on board the U.S. Coast Guard Cutter HEALY are morale dinner nights. 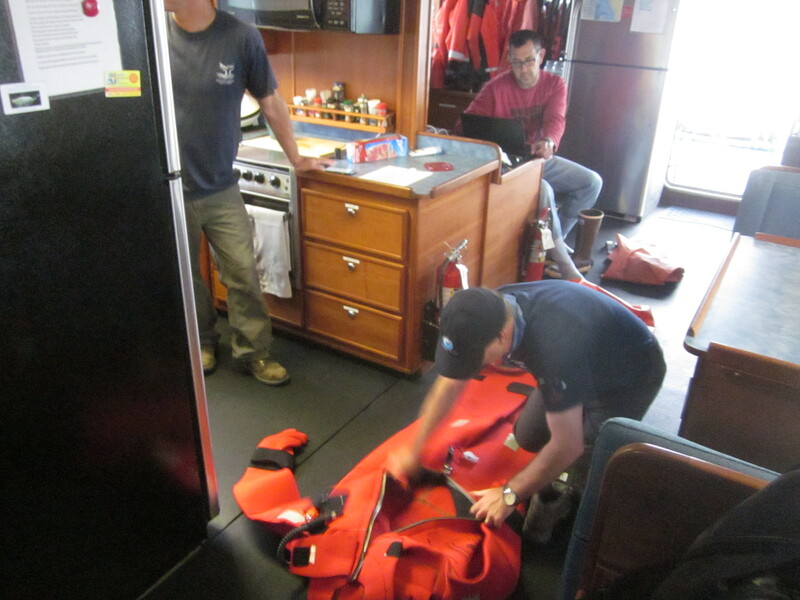 This is when different divisions within the crew prepare, cook and then clean up the evening meal. 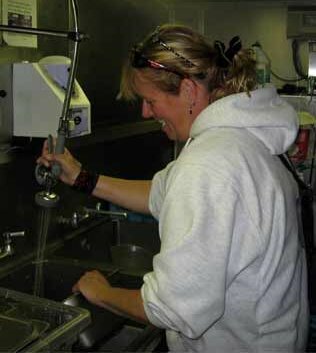 Well today was the scientists turn, and under the direction of Scott Hiller game on!Right after lunch was served and cleaned, it was our turn to invade the galley. Let’s see, hamburgers, dogs, salmon patties…to start. Potato salad, pasta salad, green salad, and baked beans, were just a few of the accessories. For dessert apple crisp (my contribution) with vanilla ice cream. It was a lot of fun working with happy people in making other people happy! When I say we invaded the galley, we really did. Kristen Blattner and I took charge of the crisp, we recruited Chris Moser and the pealing began. There are two types of crisp, the home version when the cook is too lazy to peel apples, and then the social version, naked apples. 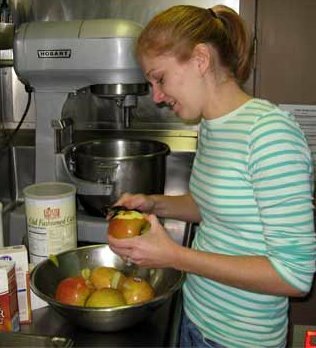 Once we had our large supply of pealed, cut apples I started the crisp, and having never made such a large quantity before was blown away by the volume of ingredients used. Once all the fixings were completed it was up to the flight deck. 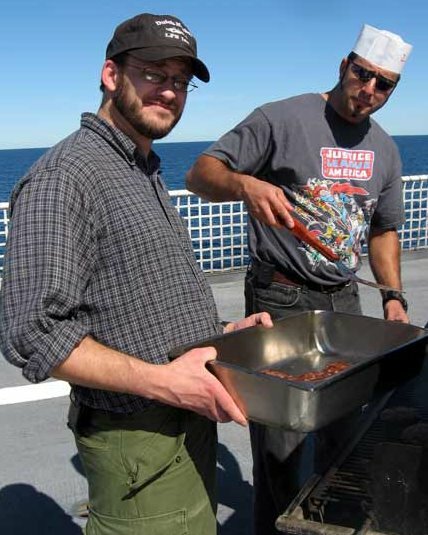 Now was the time for Pat and John to work on grilling the burgers. I managed to get a quick “calvet” in and then helped with the set up. The clock struck five, crew and scientists arrived, dinner was served. It was a beautiful sunny day, calm seas, perfect picnic weather. No fog in sight. With all sorts of tasty morsels, no one should have left hungry. 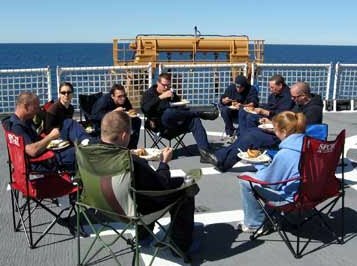 With plates laden, the crew and scientists alike sit down for a glorious evening on board the HEALY. FOR MY STUDENTS: Imagine it is the start of the day and you have worked all night, what would be your quote for the day? Lots of hands made the clean up quick and easy.